Slipknot's upcoming run of festival shows could be their last. Or they might mark the last time Corey Taylor fronts the band. The singer says the group's summer gigs will help him decide if he can continue after the death of bass player Paul Gray. 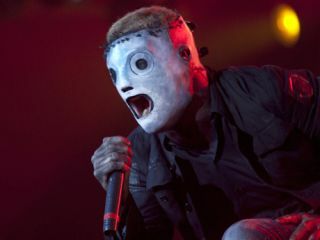 Taylor, who also leads the band Stone Sour, told Caller.com that he's still haunted by the death of Gray, who passed away in May of 2010, and he's unsure whether Slipknot should remain active without their longtime bassist. Of the group's summer shows, Taylor said, "There's a part of me that's ready and there's a part of me that's not. "I have a lot of trepidation about it," he continued. "I don't know how to feel. I know a lot of the guys in the band are trying not to show that side, and I can't." While Gray's bass duties will be handled by the group's original bassist, Donnie Steele, Taylor is unconvinced whether Gray can ever be replaced - or should be. "Without Paul Gray, there would have been no Slipknot, and I mean that sincerely," he explained. "It's strange for me to think about the future of Slipknot without him. "This tour coming up is definitely going to be like baby steps... It's going to be a long time before I feel OK about it. I'm not saying that I'm not open to it. I'm just saying that I'm not there yet, and I don't know how long it's going to take me to get there. So we're just going to have to see what happens. Only time will tell."